What do I use a CDR for? When do I have to use a transceiver with CDR? Which advantages come with a CDR? CDR is the abbreviation for Clock-Data-Recovery. Physical impacts are influencing the optical signal during the transmission over fiber optic cables. Due to the length of an optical link the signal suffers a time delay deviation which leads to problems in synchronization. In addition an optical fiber attenuates the signal which leads to a degradation of the signal. The physical impacts are linear and non-linear effects which are leading to wave distortion. The transceiver includes a Limiting Amplifier (*1), which compensates step 1 & 2 at receiver side. For step 3 (Re-Timing) there is an additional CDR chip set integrated in the transceiver. 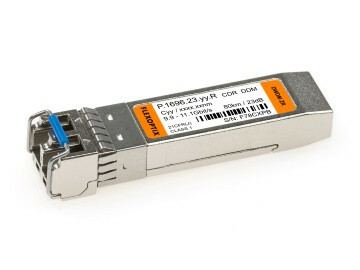 This question was raised with the introduction of SFP+ modules. XFP modules are built with CDR on-board as defined in the related MSA-Standard. To realize a cost effective and smaller form-factor this functionality doesn't become part of the SFP+ module. The idea was implementing CDR directly in the host-system of the SFP+ if needed. This would increase the price of the end-devices like switches and routers. A 2R-regeneration (Re-Amplification, Re-Shaping) is already part of the transceiver so it is not mandatory to implement a CDR function. To realize a standard link this is usually sufficient. Standard links are typically in-house wiring (Multimode), 10km, 20km and 40km point-to-point connections. But if you are planning to set up a wavelength multiplexing (DWDM), an optical amplifier or transmitting over long distances, you should consider a complete 3R-regeneration. This can be achieved with a CDR chip set either in your DWDM-transponder, host-system or transceiver. Most of the DWDM transponder-systems do have a CDR functionality on board. have impact on each other. A stable reliable DWDM link can be achieved, if you take the first four points into consideration by planning an amplified DWDM link and in addition eliminating the last point by using a 3R-regeneration with CDR. (*1) electrical component which amplifies and reshapes the incoming signal.